Grain prices have moved consistently lower since the drought of 2012. At their highs, the three major grains reached dizzying heights. Soybeans traded to $17.9475; on December 31, 2015, they were $8.70 per bushel. Corn traded to $8.4375 and by the end of 2015, it fell to $3.5875 per bushel. Wheat was at $9.4725 in 2012 and was $4.70 per bushel on the last day of 2015. As you can see, grain prices have all moved appreciably lower. The 2012 drought caused shortages of grains, since then three straight years of bumper crops resulted in plenty of supplies. So much grain production in fact that inventories swelled and prices fell. However, despite three straight years of huge grain output and lower prices, those values remain far above levels seen at the start of the new millennium. In January 2000, soybeans were $4.61 per bushel, corn was $2.045 and wheat traded on the Chicago Board of Trade Division of the CME was at $2.49 per bushel. While grain prices have moved lower from 2012 to the end of 2015, they are still all well above levels seen in 2000. 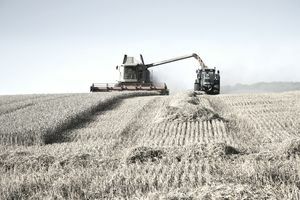 This is the case even though recent grain harvests have not only been big they have broken all-time records. There is a very simple reason for this: demographics. In 1959, the total world population stood at around 2.9 billion people. In 2000, the number of people in the world was 6.083 billion. Today there are 7.296 billion inhabitants of planet earth. In the past fifty years, the population has risen by more than two and one-half times. Over the past fifteen years, the number of people on earth has increased by approximately 20%. These are staggering growth rates. All the while, the amount of land available for growing crops has remained constant -- this land is a finite resource. Add to that growth in population and rising wealth and standards of living in formerly lesser-developed nations like China. This has led to changes in diet as many Asians have incorporated more grains and complex proteins into their daily intake. All this adds up to more mouths to feed around the world. The demand for grains and other commodities has naturally increased because there is more demand today than yesterday and tomorrow there will be even more mouths to feed given the trend in population growth. The bottom line is that the world is becoming more dependent on bumper grain crops each year. The demographic effects of growing population and standards of living mean that the base price for these agricultural commodities is naturally rising. That is why, even after three straight years of bumper crops, prices remain higher today than in 2000. That is also why when shortages occur, we will see new record highs in the future. Markets naturally become complacent -- memories are short. Mother Nature determines crop yields and total agricultural output around the world each year. Some years there will be plentiful harvests, and in others, there will be shortages. When deficits develop, we are likely to see a magnified effect on prices. This gives rise to an excellent opportunity for the future. Investing and trading are all about understanding the risk versus reward. During periods of weakness in the grain markets over the months and years to come, investors should look to this sector. There are certainly futures and option products that trade on the Chicago Mercantile Exchange (CME) as well as ETF and ETN products in the agricultural space. There are also companies that support the agricultural commodity sector with farm equipment, fertilizers and other services that are likely to thrive in the years ahead. During weak periods of the price cycle, these investments offer exciting opportunity. Feeding a hungry and growing world population is a business that is likely to become more critical in the years ahead. The finite nature of arable land for growing crops and the increasing number of hungry mouths around the world is a perfect set up for increasing prices of agricultural commodities and those businesses that support them. Do Seasons Matter When Trading Soybeans?